Trying to find the best garage door opener to go with your system can be tough. While the product’s structural integrity, functionality, and price are all things to consider, the decision also depends on personal choice, and what type of setup would best suit your needs. So when trying to figure out which brand of opener would be the best for you, it is best to consider a number of things first. Garage door openers come in many shapes and sizes, each designed to deliver the convenience of an automated system in their own way. While some may be less reliable or more-or-less cost effective compared to others, the most popular of these products are generally on a par when it comes to meeting specific needs. To whittle your choices down to a reliable system, you’ll want to ensure that you opt for products manufactured only by well-known brands like Craftman, Sears or Liftmaster. When deciding on a system that is right for you, you should take stock of your needs to determine what you require from your opener. If you're after a unit that is completely silent during operation, a belt drive is probably the right choice for you. If you're looking for something middle range and low maintenance, a screw drive opener system may be a good option for you. Any new opener you install should be able to handle the dimensions and weight of your door. Larger, heavier doors require a significant amount of power to operate effectively. A motor that doesn’t have the required power will work under too much pressure, either damaging the opener itself over time or failing to work altogether. Lighter doors do not require overly-powerful motors, so for most residential setups, we would recommend a standard system. The cost of your system is always a determining factor. But the cost of installation is not the only thing you should consider. Maintenance should also factor into your decision - a chain drive system may require more expense in the long run as more components of the system will require adjustment and lubrication over time. 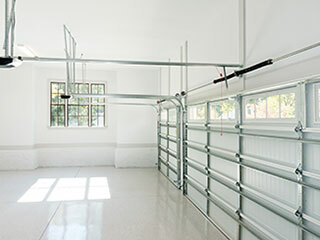 Speak to our team at Garage Door Repair Wilmette for more information regarding the long-term needs and costs of maintaining the system you wish to have installed.